Last week, Priori and General Assembly hosted the first event in a 3-part series to help new entrepreneurs launch successful business ventures. 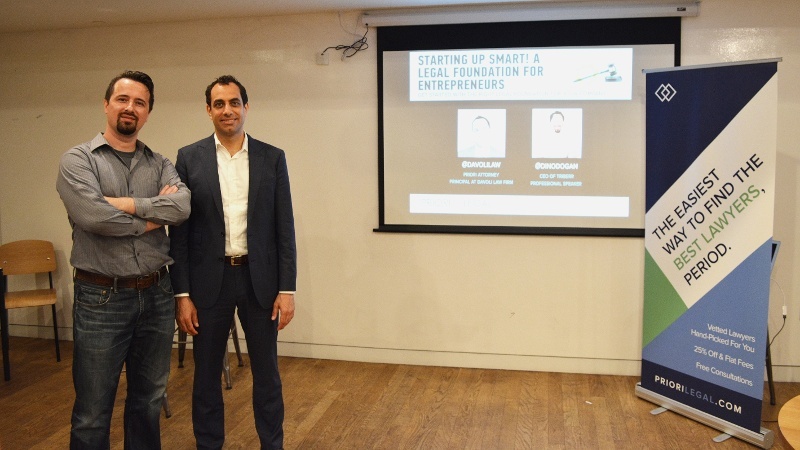 In the first seminar, Priori lawyer David Davoli and Triberr founder Dino Dogan covered the basics of company formation, including entity types, states of formation, proper legal documentation and co-founder relationships. In case you missed it, here is a summary of the top five questions and answer summaries to ensure your company gets started on the right track! 1. How do you know when to legally form your company? Talk to a lawyer early because the “right” moment to legally form your company can vary on a case-by-case basis. Many founders delay because they are not 100% sure they are going to move forward with a business idea, but it can be prudent to form an entity anyway because choosing and registering a business entity creates a legal distinction between you, the founder as an individual, and your business. Importantly, this can shield you from personal liability for the business’s debts and other liabilities. Moreover, as a separate entity the business itself can issue shares to co-founders, own intellectual property rights, hire employees and enter into contracts. As a result, if you’re ready to begin any one of these tasks, it’s likely past time to contact a lawyer to discuss choosing the right entity for your business. Pro-Tip: If you are considering starting your business as a “side-hustle,” talk to a lawyer to ensure that your current employer won’t have an ownership claim against your new business or its intellectual property. 2. How do I choose the right entity for my business? There are several forms of business organizations, including a Sole Proprietorship, a Partnership, a Limited Liability Corporation (LLC), an S Corporation, a C Corporation and a Hybrid Entity. 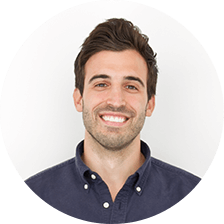 Each entity type has benefits and drawbacks, and identifying the right entity will depend on your business goals and plans. Consulting a lawyer is the easiest way to ensure that you choose the right entity, which could mean reducing exposure to liability, saving on taxes and simplifying a financing. With that said, if you are looking to seek outside investment or have aspirations to take your company public, you’ll likely want to operate as a C Corporation. If you have alternative goals, the double taxation and onerous formal requirements of corporations may create a strong incentive to form an LLC instead. And if your company has a social mission at its core, you might want to consider a non-profit or hybrid entity, such as a B Corporation. 3. Is it possible to change your business entity if you have already formed? While choosing the right entity will enable you to reduce conversion fees, changes in your business may necessitate a change in your business form. Although it will vary from state to state and by entity type, the process of converting your business entity is well-defined. Based on your state and entity type, a lawyer can walk you through the steps, whether that requires dissolution and a new formation or more simply, drafting and filing the proper paperwork. 4. What is the best state to register my business entity? While the state where your business is physically located may seem like the obvious choice for formation, there may be a compelling reason to go “out of state.” For many companies, especially those that want to raise venture capital funding, Delaware is a popular incorporation state--half a million businesses, including 64% of Fortune 500 companies have incorporated there. Delaware’s appeal stems from its well-developed body of corporate law and deference to the board of directors. Likewise, other states, such as Nevada, are trying to replicate Delaware’s appeal with favorable corporate laws like no state corporate income tax or fees on corporate shares. On the other hand, forming your business in a foreign state may require you to register and pay a fee for “doing business” in your home state and any other state you conduct business. For questions on and determining where to form your business you should seek the advice of an experienced attorney. 5. Is there a specific document that all companies should have in place before conducting business? One of the most important documents you’ll need regardless of what entity type you chose is a formal document that will outline the governance, operation and ownership of the company. While this document takes on various different names depending on your entity type--bylaws for corporations, operating agreement for LLCs and partnership agreement for partnerships--it will establish the structure of ownership, the power and duties of members, owners and partners, the meeting and voting rights, the distribution of profits and losses and the withdrawal/termination protocol. It’s crucial to enlist an experienced attorney to draft this document to account for the rights and responsibilities, as well as address touchy issues such as cofounder duties and ownership now to help prevent debilitating ownerships disputes later. If you want more information on these or any other questions with respect to getting your company up and running, a Priori attorney can guide you through these important early-stage decisions based on the specific nature of your business and your future plans. 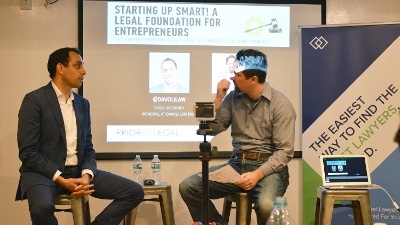 To learn more about how to start your company up the right way, join us for Phase 2 of Starting Up Smart on 6/3, where Priori intellectual property lawyer David Boag will walk you through protecting your startup’s intellectual property.